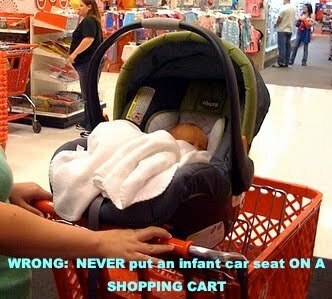 Infant Car Seats do NOT belong ON Carts! This is so DANGEROUS!! I really dislike seeing this when I’m out in stores, every time I see this, I want to run up to the parents and kindly let them know what danger they are putting their infant in, placing this unstable car seat atop the cart. Infant car seats were not designed to be securely attached to the top of a shopping cart. The car seat has no way of being strapped in or being “clicked” in and safely and soundly being attached to the cart. It’s just placed on top of the cart with hope that it doesn’t accidentally fall to the ground with baby in it, well the truth is accidents happen, and when you least expect them, so Please Do Not Do This! 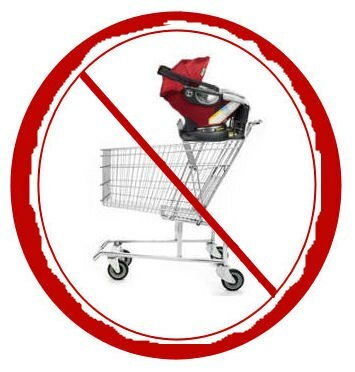 If you end up bringing your baby in, while he or she is in the car seat, please, please, please, place the car seat in the back of the shopping cart. There is no way the carseat or the baby can fall out now. Or better yet, wear your baby =), blog post to come about babywearing,and the different kinds of wraps to choose from. This entry was posted in Uncategorized by ashleethebabyplanner. Bookmark the permalink.